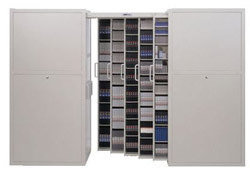 Gemtrac is a high density, quick access storage system that makes efficient use of your floor space. 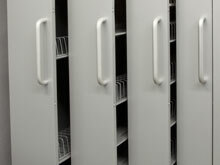 Each Gemtrac consists of two large cabinets with vertical drawers. 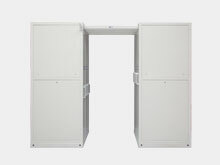 Each Gemtrac unit consists of two large cabinets facing each other, each with pull-out vertical drawers that share common overhead tracks. 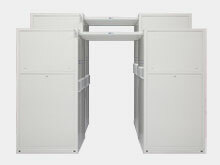 Units ship set-up facilitating a quick and simple installation process. 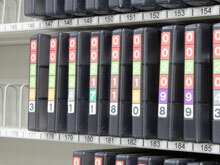 A typical unit consists of 10 drawers holding about 4,500 LTO tapes in just 25 square feet. 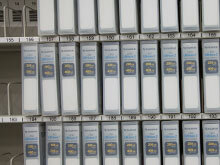 Units are set side by side to create a media aisle where thousands of tapes can be accessed within just a few steps. 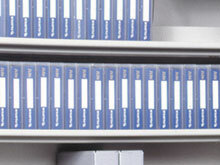 Each open drawer exposes 400-500 tapes for quick access. 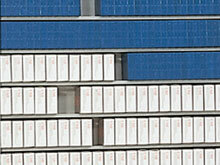 Units may even be double or triple stacked to utilize vertical space. inches wide, and 30.25 inches deep. 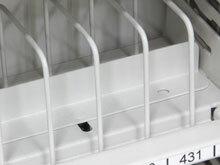 to include gang locks to secure all drawers. 4 drawer widths; 5, 5.5, 6 and 7 inches. 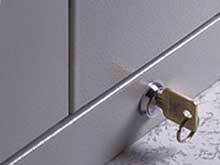 to provide finger space for easy retrieval. to the front of the shelf. 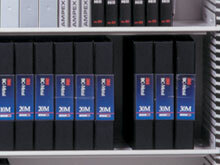 all audio and video tape and disc formats. 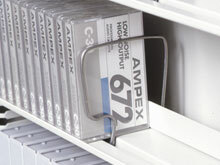 for 16mm and 35mm Roll Film.